First Year classes are not streamed on the basis of the Entrance Assessment Test. Pupils are put into three or four classes of mixed ability. Streaming may take place after first year in some subjects such as Irish, English and Mathematics. It is a feature of the school that no matter what banding takes place we arrange the timetable in such a way that all pupils have the opportunity to study higher Level in all subjects for both Junior and Leaving Certificates should their ability allow it. Currently First Year students take either German or French unless they qualify for an exemption. All students will also choose one from Art, Music and Technical Graphics following a period of sampling in each subject. The decision will be made between the Halloween break and the Christmas holidays to ensure the students have a suitable trial period in all subjects to ensure that they can make an informed decision. The criteria governing the choice are each student’s ability in and suitability for the subject combined with the preference expressed by each student. Supervised study for those who wish to participate begins at 4-10 pm and can be taken until 6-40 pm from Monday to Thursday. Supervised study on Friday begins at 3-20 pm and finishes at 4-50pm. Each First Year class is assigned a class teacher whose function is to see that the pupils settle into school and to be available to the students should any problem arise. The Year Head complements the class teachers, especially taking care of any discipline problems that might arise. The C.S.P.E, S.P.H.E, and Religion teachers are also significantly involved in the pastoral care area. As part of the Department of Education led ‘Wellbeing programme’, there will be a number of modules throughout the school year covering areas such as Computer skills, Nutrition and Personal Development. The Pastoral Care Committee comprising The Principal, Mr. Carew, The Deputy Principal, Fr. Shem and The Guidance Counsellor Mr. Hoyne meets once a week to discuss the wellbeing of students and address any issues or concerns about students which might have been conveyed either by a Year Head, Class Teacher or Subject Teacher. Each year 10 Leaving 1 students, who are selected by interview from the list of candidates, undergo a week’s training in Castletown in how to be a successful Meitheal leader. Their purpose is to mentor the First Year students throughout their first year in Knockbeg College. This starts on their first day in the College during which they are brought on a tour of the school and participate in games and activities during the afternoon. These help to break the ice for the First Years and allow them to start making friends and integrating into Knockbeg. Each Meitheal leader is responsible for mentoring up to 10 students in his group. 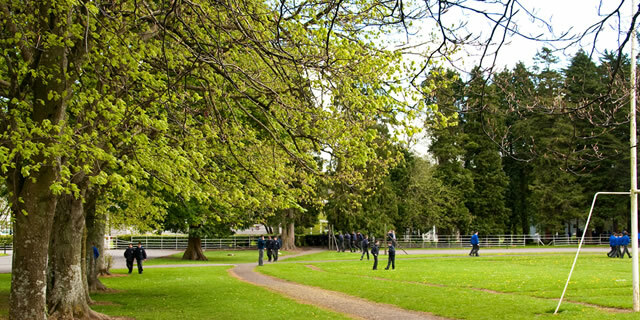 Throughout the year the leaders organise activities for the First Years, sometimes in conjunction with the other local schools which also have a Meitheal group. They also meet the First Years on a regular basis throughout the year. They will also discuss matters pertaining to their responsibilities with the Principal on a formal and informal basis.